Image courtesy of This concerned citizen is worried about the name-change epidemic that is sure to follow. 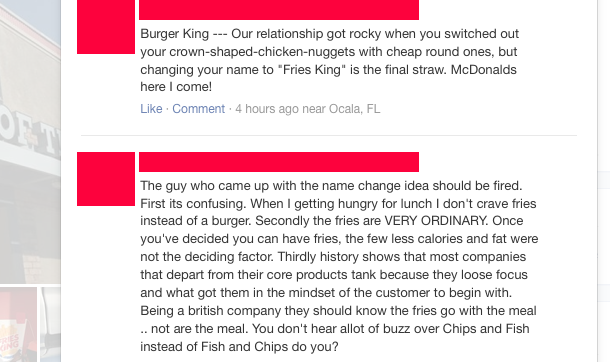 These are just two of many complaints from people who inexplicably believed that Burger King changed its name to Fries King. Scroll down for more, if you can stomach it. We’re constantly being told that we are a jaded and cynical people who are unwilling to believe anything at face value and read signs of predatory marketing attempts in even the most innocent of gestures. But leave it to social media and one of the world’s largest fast food chains to show that some folks will be taken in by even the most blatant marketing gimmick. In case you hadn’t heard, Burger King — a global, multibillion-dollar foodservice operation with nearly 60 years of history and a brand recognized by just about anyone — claimed on Wednesday that it was changing its name to “Fries King,” and even posted photo evidence of a one restaurant that had supposedly been updated, complete with new cups, a new sign, T-shirts and all the other things you might need to revise as the result of a name change. Speaking of which, just ponder for a moment all the potential jokes that could be made if the company did change its initials to FK. This concerned citizen is worried about the name-change epidemic that is sure to follow. Two angry customers provide some historical context for why they are upset about a completely fictional name change (to a fast food restaurant, of all places). Y U so angry about a fictional name change dood? This guy saw the possible profane humor in the FK initials, but the entire “advertising gimmick” thing apparently went over his head. She won’t give into your attempt to change the name, she just won’t so don’t try! We THINK this is a complaint about the name change. It might also be a Chaucer excerpt. I’m not so secretly hoping that these comments were actually planted by Burger King employees with the goal of getting a cynical jerk like me to write about their silly marketing ploy. It would mean I’ve been played for a sucker, but it would also restore a little bit of my faith in humankind.